I traveled all the way to Shanghai from Hong Kong to watch my first live show, so I was really excited, especially since it was my first live event, and I missed out on two Raws when I was living in Boston. Pretty packed house in Shanghai. About 25 percent of the arena was taped off (behind the entrance ramp and nosebleeds opposite entrance). I came into this expecting weird crowd reactions. My friends Craig, Phil, and my dad had seats by the entrance ramp, which made for good photos. There were a lot of Cena t-shirts. They'll be disappointed that he's not here. Daniel Bryan is way over. There was a whole section of Bryan fans with "Yes!" signs. I was a little disappointed in two things: no pyro at all for the show and the security guards kept telling people to sit down during the matches. People always stood for the good spots, but security kept yelling at the crowd. Also, buying shirts was a mess. People in Shanghai don't like to line up for things. (1) Justin Gabriel beat Jack Swagger. Long match. Justin is over, Swagger not so much. Gabriel won with the 450 splash in about ten minutes. Oddly slow-paced match. (2) Yoshi Tatsu beat Jinder Mahal. Mahal came out and did a promo in Punjabi and English, challenging anyone from the back before Yoshi Tatsu came out. Quiet crowd and dead most of the match. Yoshi won with his finisher, though, he might have hurt his arm. The ref was checking on him a lot after the match. match with Barrett using a newer finisher, which looked something like a swinging Rock Bottom as he catches a guy running into him (Winds of Change). Definitely better than Wasteland. (5) Randy Orton & Rey Mysterio & Zack Ryder beat Primo & Epico & John Laurinaitis in a six-man tag match. Orton got the pop of the night. Huge pops for all the faces throughout the match. A brawl ended in Johnny taking all of the finishers and Orton pinning him after a 619 into an RKO. The faces stayed a while after the match to pose for pictures and sign autographs into the intermission. 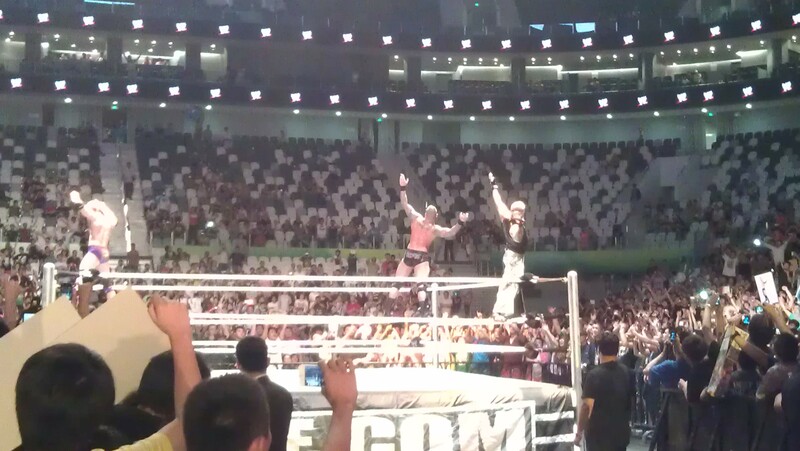 Orton also got everyone into a Ryder chant and held up his arm for the crowd. When they were leaving, a guy hopped the rails and ran towards Orton and was tackled by security. Orton brushed his shoulders and smiled more for the crowd. (6) WWE tag champion Kofi Kingston beat Daniel Bryan. Bryan is way over, with both pops and heat. He teased leaving the ring when the crowd started A.J. chants. They both played to the crowd great with the "Yes / No" chants. This was easily the match of the night lasting over 20 minutes with Kofi winning clean. (7) U.S. champion Santino beat Cody Rhodes to retain the U.S. Title. Cody came out and gave a really good promo on how he was the Royal Rumble MVP. He ven threw in some Mandarin at the end (couldn't hear all of it, but I believe it was "I'm not scared of the Cobra." The crowd loved Santino's comedy act, and he won with the Cobra. (8) World Hvt. champion Sheamus beat Kane, Alberto Del Rio, and Big Show in a Fatal Four-way match to retain the World Title. Sheamus won with the Broge Kick on Del Rio in a very good match with a lot of good nearfalls that lasted about 15 minutes. Del Rio was particularly good in the match. Overall, this was a very good show and I advise everyone to go out of their way to watch a house show if they like longer matches, with the wrestlers clearly playing more toward the crowd.